The War of the Worlds by H. G. Wells was first published in 1897, and it is perhaps the most famous and influential science fiction story of all time. Fantasy stories usually involve regular people facing extraordinary experiences, often in a tale of their journey to a strange land. Wells was one of those authors who flipped the premise, by having the strangeness make the journey, intruding into our everyday world. His story is about an alien landing, the beginning of an invasion by conquerors. The Martians have no interest in communicating with humans, who they see as pests that must be exterminated before they can inhabit the Earth. Without meaning to, the Martians unite mankind. The 1938 CBS broadcast of Orson Welles and the Mercury Theatre's adaptation of The War of the Worlds became the most famous radio drama of all time, and due to its documentary-like presentation some listeners thought a real war had come to the USA. The real thing would come just a few years later with the bombing of Pearl Harbor drawing the States into the Second World War. "Is it a blessing, or will it smash humanity?" The atomic bomb was seen by some people as a tool to bring peace. In the closing days of World War II, shortly after the bombing of Hiroshima and Nagasaki, a survey conducted by Gallup Poll in late August 1945, showed that 69% of the US public felt the atomic bomb was a "good thing." However, afterwords there were those with some rising serious concerns about its destructive potential. 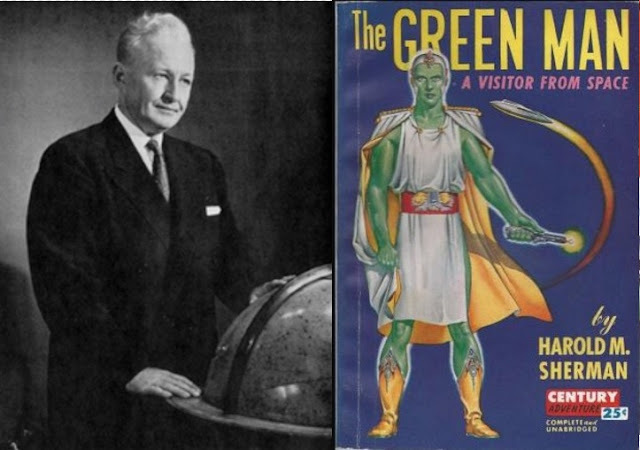 Harold Sherman and his messiah from Mars, Numar, The Green Man. "I had a series of visions wherein I saw Space Beings, possessed of high intelligence, visiting our Earth in space ships of different shapes and sizes, for the purpose of exploration and eventually to fill our skies with large space vehicles, coming in force, hopefully on a friendly mission to help Mankind save itself from self-destruction." 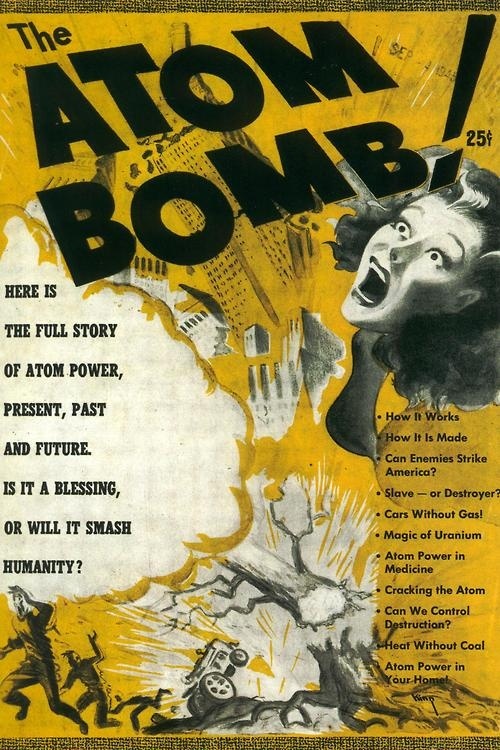 In the 1947 sequel, The Green Man Returns, Numar comes back to deliver "A New Plan of Living which will solve our earth’s problems and bring about true brotherhood," which would end war and the associated threat of atomic bombs. 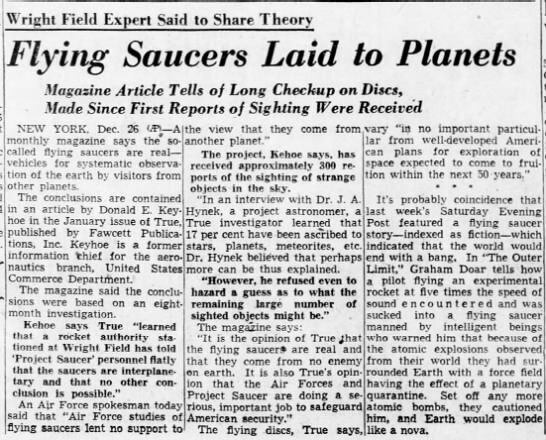 On Oct. 9, 1946, there was a report of Kareeta, a spaceship visiting the Earth, piloted by Etherians, peaceful visitors who didn't land because "they're afraid of the reception they'll get." The Borderland Sciences Research Associates had established telepathic communication and later disclosed that "at every great crisis . . . or just prior to the collapse of civilization, they make an extended survey here for their own information and historical records." "Among those who can think there is a growing sense of worry and fear. That our culture is nearing a breaking point... There is a gathering of Powers, a search for places of safety, the building of two great armed camps. There have been many prophecies... In 1937 a remarkable prophecy was received in America from high spiritual beings and sent to Dr. Alexander Cannon, in London. who reproduced it in his book, The Power of Karma... This revelation tells of a 'great migration of celestial beings' ages ago, who came to this planet from outer space..."
Worries about the A-bomb grew in people's minds, and the best hope for world peace seemed to be the United Nations. 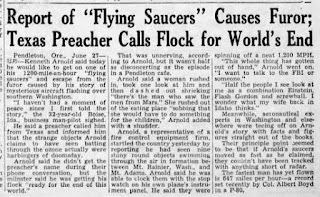 When flying discs hit the news in 1947, some people suspected connections between atomic power and the flying saucers. 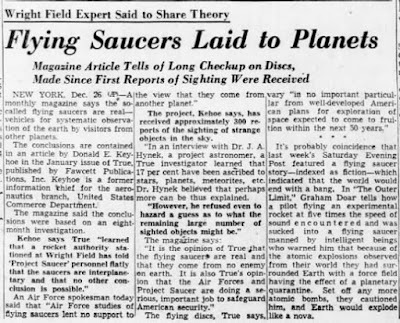 Others thought flying saucers were a sign that the world was ending. It may be the coming of the Judgment Day"
At that time, only the mystical fringe that had already believed we were being visited by extraterrestrials gave serious consideration to flying saucers having an outer space origin. Among them, some took it as a sign, that our ancient gods were back, and here to help. "Will the ancient gods... come back in time to avert an atom war?" From "Son of the Sun." by Millen Cooke (as Alexander Blade) illustrated by James Settles. Fantastic Adventures Vol.9. No.7. November 1947. The 1948 novel, The Flying Saucer by Bernard Newman was about an alien invasion prompting the United Nations to unite the world against a common outside enemy. The invasion was a fake, a conspiracy by scientists who were committed to bring peace to the world and remove the threat of atomic war. "Everyone has heard of the United Nations... But what is the UW?" In Captain Marvel Adventures #98, dated July 1949, the super hero sees a flying saucer and decides to solve the mystery. Following it to its home planet he's surprised to learn, "Holy Moley! Our Galaxy has a government!" The United Worlds "was formed 1000 years ago to eliminate all war, crime and evil in the galaxy." Earth has ben denied membership, but the UW eventually has a change of heart after demonstrations of CM's heroics, but he says, no; the Earth has yet to earn its membership. The United Nations seemed stymied in keeping the peace on Earth, and with the A-bomb in play it it would be terrible. In times of trouble, people often look to help from above, and in the age of flying saucers, there were some new possibilities. Science fiction magazines had come into bloom in the 1920s, full of visitors from other worlds, spaceships and almost every other concept that later surfaced in connection with UFOs. Not everyone read SF magazines, but almost everyone read the newspaper, listened to the radio and went to the movies. In the 1940s, the best-known science fiction to the average person was from the comic strips, Buck Rogers, Flash Gordon and Superman, but most would also have remembered the notorious Martian invasion from the The War of the Worlds. Those stories introduced the basic science fiction concepts to an audience of millions of all ages. The science fiction magazines reached a much smaller but devoted audience, and one publication was doing something different. In 1944, Ray Palmer introduced the Shaver Mystery to the readers of Amazing Stories, presenting it as a genuine case of extraterrestrials having an active presence on Earth. Palmer also encouraged readers to write in with reports of their sightings of strange things seen in the sky. It was the magazine's policy that alien visitors had come here, and that the space ships were real. Ad for FATE magazine, Amazing Stories, dated May 1948. 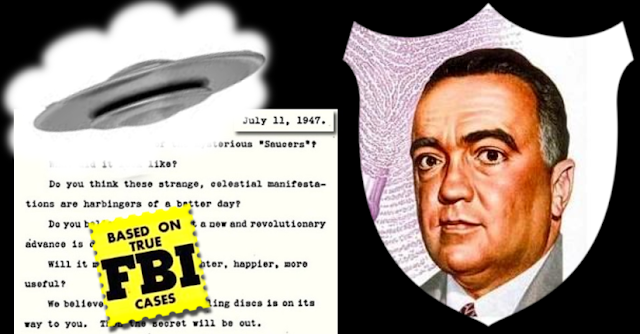 When saucers arrived in 1947, Palmer offered them as evidence that they were connected, proving Shaver's stories were true. 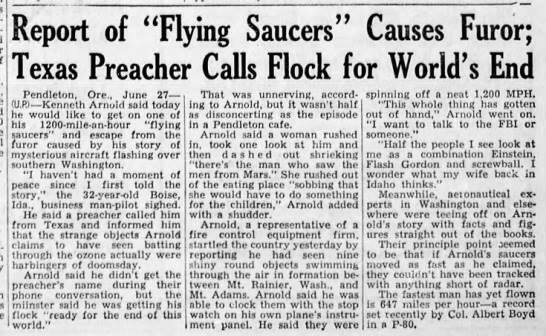 Together with publisher Curtis Fuller in 1948, he launched Fate a magazine on the occult, and the the cover feature of the first issue was, "The Truth about Flying Saucers." The notion of ET saucers was being put out, but the mainstream thought of it as kid stuff, that men from Mars belonged in the funny pages with Buck Rogers. Two magazine stories were about to go a long way towards changing that perception. Graham Doar's short story, "The Outer Limit" debuted in The Saturday Evening Post dated December 24, 1949. 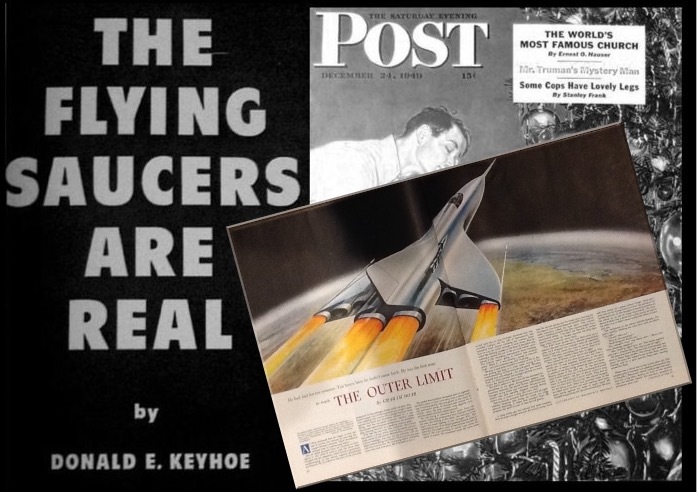 It hit the newsstands shortly before the January 1950 issue of True magazine, which carried Major Donald Keyhoe's famous article, "The Flying Saucers Are Real." The following newspaper article discusses both stories. 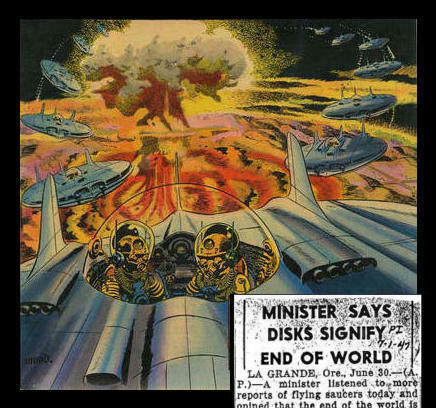 It's probably a coincidence that last week's Saturday Evening Post featured a flying saucer story – indexed as fiction – which indicated that the world would end with a bang. In "The Outer Limit," Graham Doar tells how a pilot flying and experimental rocket at five times the speed of sound encountered and was sucked into a flying saucer manned by intelligent beings who warned him that because of the atomic explosions observed from their world they had surrounded Earth with a force field having the effect of a planetary quarantine. Set off any more atomic bombs, they cautioned him, and Earth would explode like a nova. While The Saturday Evening Post had a massive circulation, ‘The Outer Limit’ reached a much wider audience than just the magazine’s subscribers. ...Doar’s story “may be the most often used science fiction story in radio.” ‘The Outer Limit’ was dramatised five times on radio and twice on television. This is looking to be a very interesting story. I hope you get around to the 1955/57 TV series 'Science Fiction Theater' which features a lot of alien contact stories, two are of especial interest, the first 'Hour of Nightmare' (June 1955) is a crashed saucer/dead alien story, the second 'Sun Gold' (December 1956) is the oldest Ancient Astronauts story I have yet been able to find. Thanks, Graham. 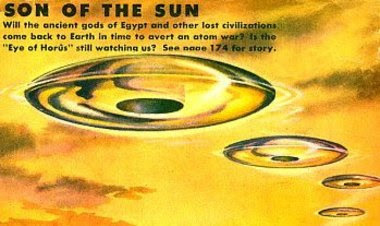 Be sure to check out the "Son of the Sun" link in the article, perhaps the first ancient astronauts story directly linked to saucers. We can find earlier stuff, but it's more spiritual like Theosophy- until you get to the Shaver Mystery. The later TV shows are interesting, and some were influential, but all we can be certain of is that they provide a measure of how the concepts about aliens and UFOs were being reflected in our culture. In almost every case, science fiction seems to have gotten there first, but early on, SF started incorporating lore from saucer reports into their stories, a bit like a chicken eating its egg. Thanks, just looked the story over, interesting. Both of the episodes of 'Science Fiction Theater' are available on YouTube at present. 'Sun Gold' is well worth the watch, the script writer had a better understanding of what would constitute the kind of evidence of Ancient Astronauts would get scientists out into the field to test it than either Von Daniken or his successors ever did. Your reference to the 1948 novel The Flying Saucer reminds me of the controversy with Alan Moore "ripping off" a concept from The Outer Limits TV series for the ending of his graphic novel The Watchmen. Nothing new under the sun indeed. The Comics Beat article is good, and I'd just discovered the Tales of Suspense story last week. The idea of an alien invasion uniting mankind is shopworn as they suggest. In Bernard Newman's novel, his characters even address it. Moore's is a notorious plagiarist, but in the Watchmen ending, he was just recycling a science fiction cliché.